Key-Frame Extraction is made up of 5 single-channel videos and 1 audio work. 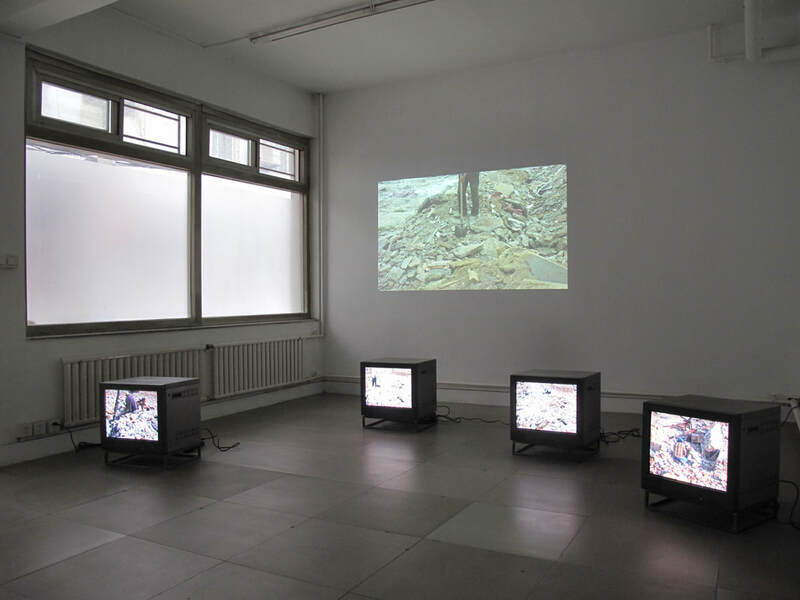 The videos show a group of quarrymen, whose job is to collect bricks from the ruins of demolished houses so as to recirculate them. These stone collectors are comprised of family units from Hebei, couples and individuals from Sichuan who have come together but have no familial bond with the other travellers. There is an organized hierarchy of labour that surfaces in this community: the couples from Sichuan get the job of recycling most of the bricks that are above ground, couples from Hebei unearth and recycle the bricks from the under-ground foundations, while vagrants and individuals without any social bonds can only seek to recycle the random and difficult monolithic sections of bricks left among the architectural debris. Each of the 5 single-channel videos is focused on a single person, who, work endlessly, day after day, repeating monotonous movements with simple tools. In contrast with the technological spectacles of production in the industrialized outside world, the landscape of ruins and the simple physicality of labour here make it a world unto it’s own. It is as if society had returned to a different time when manual labour was our natural status as we were the only means of production. In this scene the old Chinese maxim that “physical health is the foundation of everything” still exerts power but has lost it’s meaning. There are 4 video monitors placed on the floor and one larger scale projection on the back wall of the gallery behind the TV’s creating a stage like setting for actors in a play. 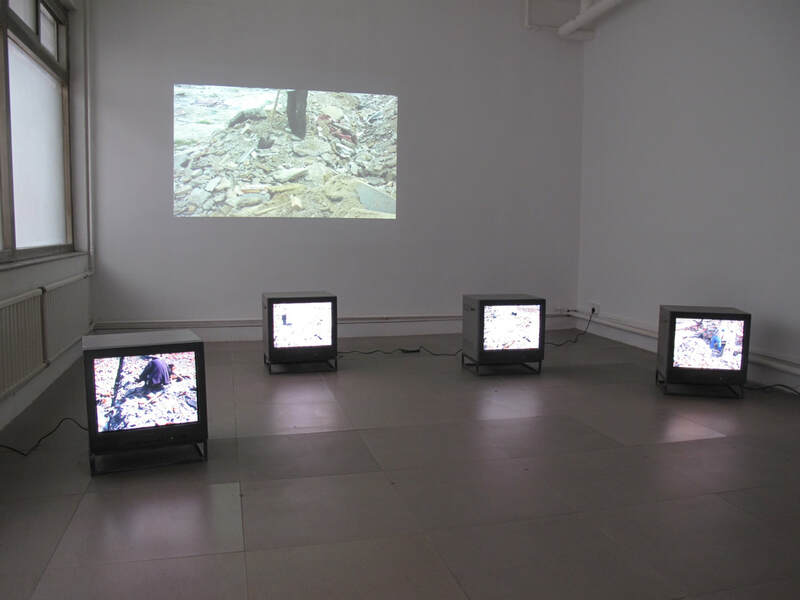 The video projection is of an old man, a vagrant, working slowly and alone. The camera angle is from above looking down at him, which is a subtle reference to the usual socialist realism portraits where figures are always shown from below looking up which creates a heroic bigger than life pose. On the video monitors on the floor, a Hebei couple and 2 Sichuan individuals are filmed with the same downward looking lens. By placing each person onto separate monitors they are separated and detached from any family or geographic ties. No matter their social caste they are all equal in their plight and fate. Zeng Hong’s intention in this is to illustrate this equality of being across the social and political strata and it’s common fate. 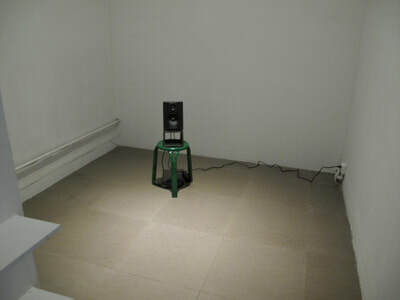 In the small gallery is a solitary speaker on a stand of the floor. It stares at you blankly as you enter the room hissing superimposed recorded sounds from radio signals and factory workplaces. It is unsympathetic, monotonous, and without end and seems to audibly bridge the two galleries by giving voice to the silent videos, a soundtrack for the lonely individuals and their place in some sort of abstract collective workforce. The title of the show, Key-Frame Extraction, is a highly technical term describing a method for intelligent extraction of key-frames from a video that can depict and direct (change) meaningful content in the video.